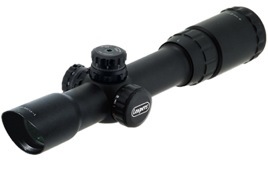 Vortex optics makes fine scopes at very reasonable prices. The Strikefire is similar in appearence to an Aimpoint but differs greatly from there. Something most optics of this type don’t have is the ability to be used with night vision equipment—this one does and with a retail of $179! 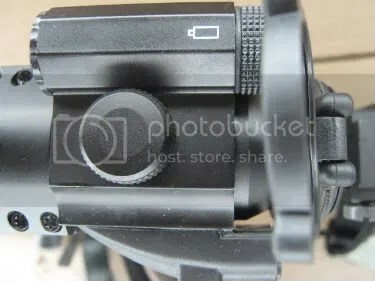 A 2X magnifier is included and screws into the rear of the optic. The red dot is 2MOA. The sight uses one “N” size battery giving approx. 500 hours of runtime. Flip-up scope covers are also included as is the battery. Of course removeable caps adjust for windage and elevation. Field of view on the Strikefire is normal for the type which translates into a fairly wide view with a bright very clear dot thanks to quality glass and electronics. When the 2X magnafier is attached the field of view narrows considerably. The red dot also increases in size to roughly 4X. Not bad at all but I would prefer a smaller dot for medium ranges. In the photo above you’ll notice the on-off, brightness and night vision controls are on the side mounted control panel. Front top is the on/off switch while the rear has an up arrow to increase brightness and a bottom arrow to dim the red dot. The NV button is activated by simply pressing it in. 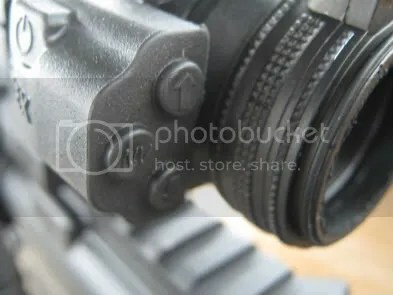 The rear of the sight tube is knurled for rotation by turning it right or left.This allows the user to adjust for an individuals vision. Each end of the tube has a rubber ring for protection from rain or other moisture. The Strikefire is completely waterproof. The rubber ring also creates a waterproof seal when the magnifier is screwed in. The Strikefire comes in two variations. The first has a setting for a green or red dot while the one I obtained for testing is a red dot only. I chose this since the red dot only has a considerably longer run time. Options available include a screw in killflash to prevent any light reflection from the front of the sight. A short mount is an option. In fact one is included with each sight you simply specify which one you want. A 3X magnifier can also be purchased seperately. 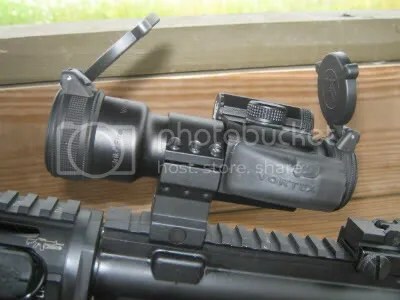 The larger magnifier mounts seperately behind the Strikefire. 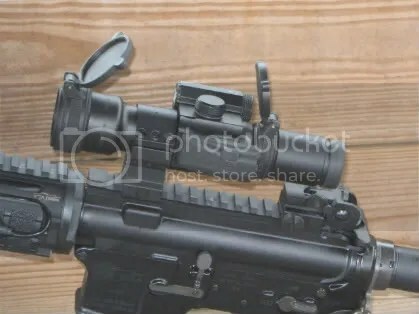 This optic has a swing out mount. After taking my AR to the range with the Strikefire mounted I fired 100 rounds at various distances with and without the magnifier. The sight held up well as did the mount with no loss of zero. Even with the magnifier and the larger red dot I was able to hit my targets at 100 yards without difficulty. I did take the time to remove the sight and then re-attach to see how much off my original zero had moved. As it turned out the original zero was still right on the money. 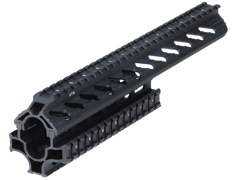 The Strikefire as well as all optics from Vortex have what they call a VIP warranty. The unlimited lifetime warranty shows the confidence they have in the products they sell. It’s very simple you have it fixed or they send a new unit. No hassle and a very short turnaround time. When one compares the quality of this optic and features not found on others at twice the price it’s a hard scope to beat! Most dealers actually sell these for $149.00! If your looking for this type of scope the Strikefire is certainly worth looking at. For some time I’ve wanted a high quality optic for my AR15 carbine. After my recent purchase of the CMMG carbine it was time to pick one. Of course there are a good number of optics out there for the AR platform such as the Aimpoint, Trijicon and Elcan . I’ve used Aimpoints and Trijicons before and they each have strong points. After going over all the attributes of each and how I use my AR I decided on the ACOG TA-33 in 3X with a red chevron reticle that is calibrated for the .223 out to 600 meters as seen below. I contacted the good folks at Mounts Plus and purchased this ACOG as well as a fiber optic front sight to replace the stock front BUIS standard sight. 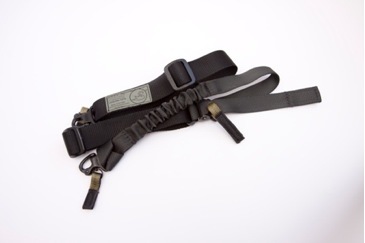 Mounts Plus makes this fiber optic and the package includes a front sight tool, a wrench to help adjust the sight once installed it co-witnesses with the ACOG and the front sight jumps out at you and is very easy to see. 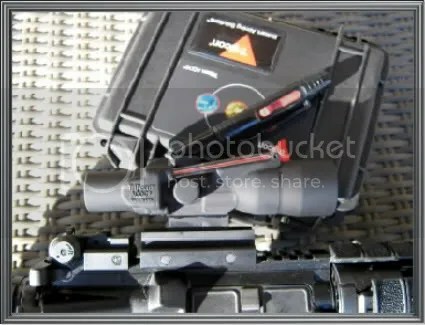 The package also includes several colors of fiber optic rods so you can change them out or replace worn out inserts. 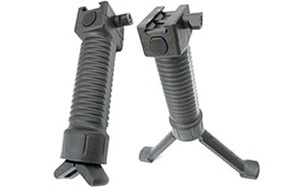 The replacement front sight included in the package is well made and has positive clicks when adjusted. A red tube is installed when you recieve it. Human vision is based upon a binocular (two eyes) presentation of visual evidence to the brain. The word binocular literally means using both eyes at the same time. We most often associate this word with binocular instruments such as field glasses or a binocular microscope. These instruments specifically strive to present the object to be viewed the same way to both eyes. Vision research material was examined for its assistance to understand the optically aided weapon aiming process. Three major types of optical enhancement were compared. There are strong customer preferences in reticle designs, some simple reticles enhance the speed of target acquisition, others allow for greater precision in a given time limit. The simple substitution of a bright red dot for the usual cross-hairs makes it very easy to keep both eyes open. Just as in the Single point or Armson O.E.G. sighting, the brain merges the two images. During dynamic movement, the scene through the telescope blurs because the image moves more rapidly due to magnification. The one eye sees the bright dot against the blurred target scene, so the brain picks the scene from the unaided eye. The shooter swings the weapon towards the target while perceiving the dot indicating where the weapon is pointed. As soon as the weapon begins to become steady in the target area, the brain switches to the magnified view. 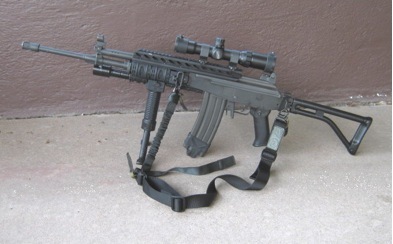 A long search was made to try to combine the speed and non-battery features of the Singlepoint or Armson with the precision of the telescopic system. This discovery was made several years ago. Trijicon has sponsored research in the field of human vision to better understand this generic phenomenon. Although the study concentrated on the Armson O.E.G., some aspects are applicable also to the Bindon Aiming Concept. With the extended eye relief this optic works at CQB ranges as well as very useful for medium range targets. Sighting in is done at 25 meters or a little over 28 yards. After this is done your good out to the max range. Of course you need to check the calibration at 100 yards. Minor adjustments are made and that pretty much sets the scope out to 600 meters with no need for any further adjustments. The aiming point is at the top point of the chevron. 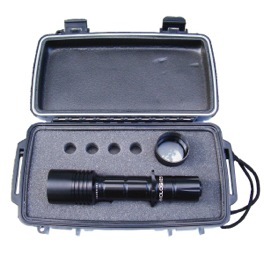 The ACOG comes with a Pelican hard case to protect the sight when not installed on your rifle. Also included is a cleaning Lenspen which one end has a brush with the other end a soft round buffing piece. 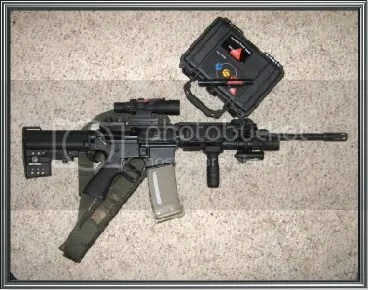 This model ACOG uses no batteries which is a big plus. 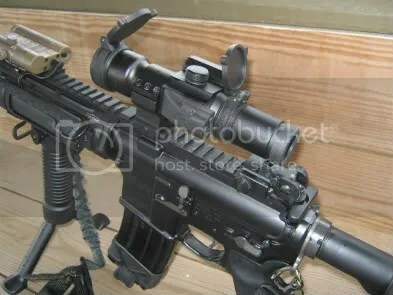 During daylight use the fiber optic rod on top of the sight gathers light for a nice clear sight picture. In total darkness the Tritium ampule kicks in and maintains a bright red chevron. The sight is very precise with super clear glass with no distortions at the edge of the field of view which is often seen in less well made optics. I’ve used it up close as well as out to 200 yards and found it performs very well. I am very pleased with this setup and plan on using this optic for many years to come. No doubt it will stand up to hard use. It’s also waterproof to 66 feet. It’s also the newest model Trijicon makes and was designed for Law Enforcement and Military use. The people at Mounts Plus were very helpful in my decision and even added a few goodies with the package. 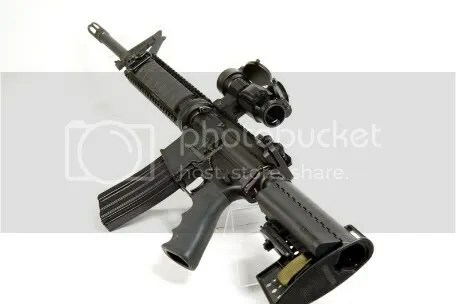 I’d sure recomend them to anyone looking for an optic as well as mounts and other tactical accessories. Please contact me if you have any questions about this superb sight system.